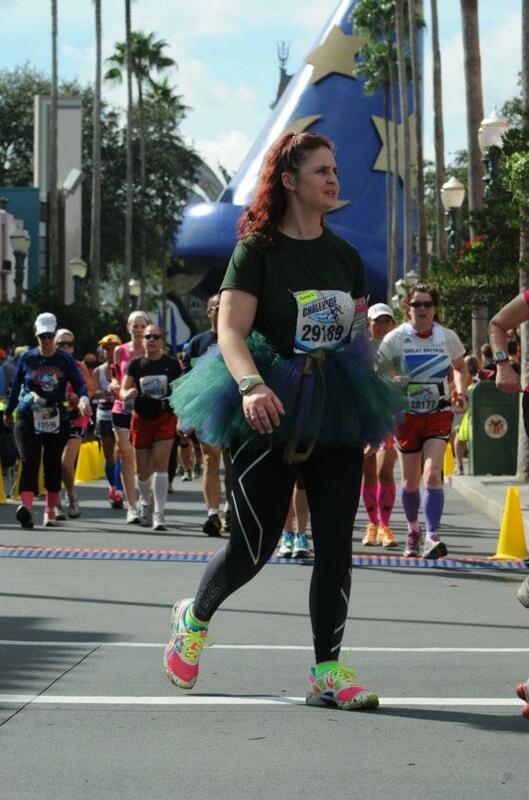 I’ve done several marathons and half marathons and the Disney has been the most fun so far. 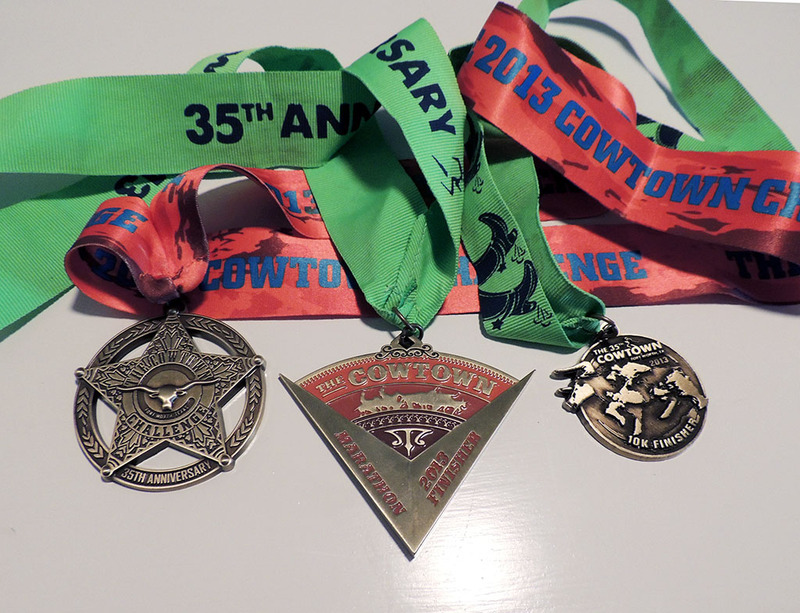 I did the Goofy, which is a half marathon on Saturday and a whole marathon on Sunday. I went into it thinking I was going to try for a PR in the whole, and goof off during the half. During the half, it became clear that with the mid-80s weather and humidity, that wasn’t going to happen. It was the hottest Disney marathon ever, according to an official I talked to. So, I just decided to have fun. I’m not built for speed anyway. 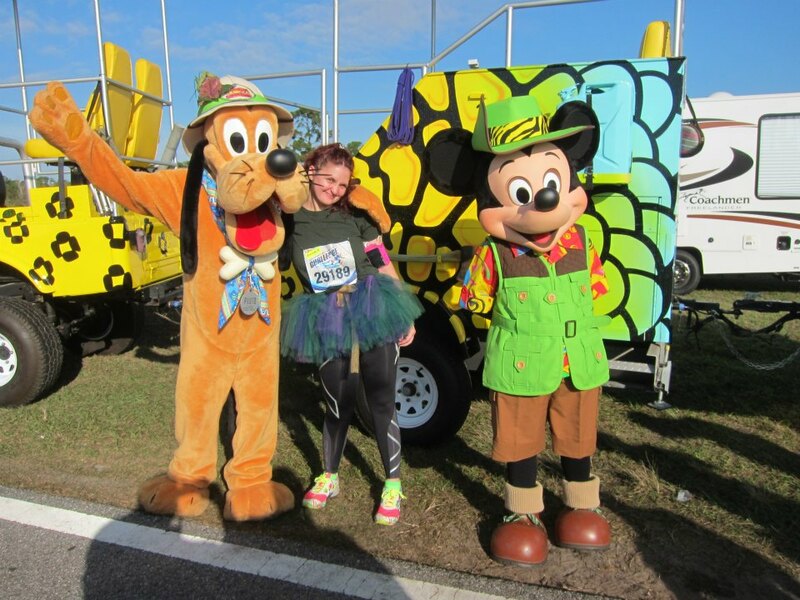 The Disney marathon is great if you love Disney World. I would do it again (it’s costly). The marathon takes you through all four parks (the half just went to the Magic Kingdom and Epcot) and all around Disney property. I didn’t think enough of it was in the parks, but I guess that can’t be helped. The best parts were inside the parks. 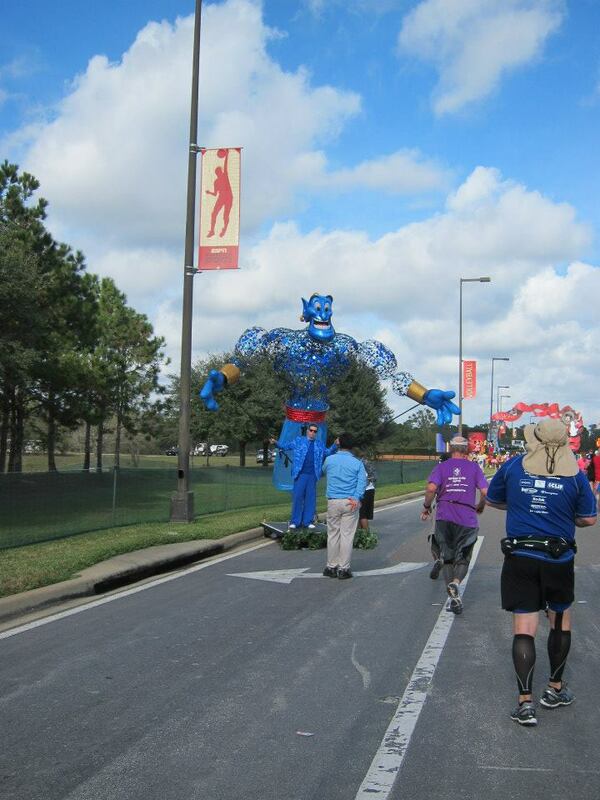 The worst part was the additional loop through ESPN World of Sports at around mile 18. I’m not sure what those miles were like last year, but that part was brutal for me. The half and the whole started pretty much the same. The first few miles you make your way to the Magic Kingdom. It was dark at this point, and not that hot at all. During the half, I slipped off some uneven pavement and fell a little. I thought I twisted my ankle, but thankfully it seemed ok. During the whole, I stayed away from the edges. 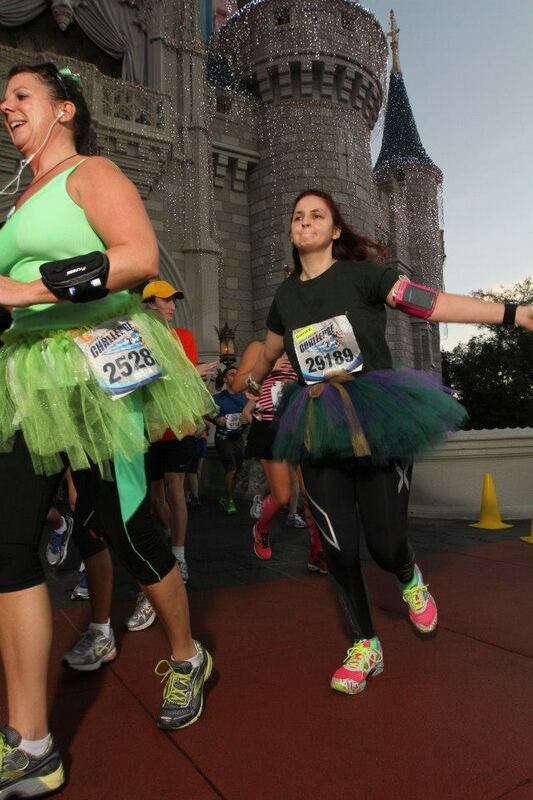 The fun part came at around mile 6 when you entered the Magic Kingdom and got to run through Cinderella’s Castle. The park was filled with spectators cheering you along, yelling out “Go Merida” (I was dressed as Merida from “Brave”), and holding up fun signs (“Sweat is liquid Awesome”, “What do you mean this isn’t the 3:00 parade?”, “I’m a stranger, and I’m proud of you.”). The crowds in the parks were really uplifting. You didn’t really need it at mile 6, but it was still nice. At this point in the race, I had decided not to stop for photos, though there were a few characters here and there for runners to stop and meet. I remember Jack Sparrow, Ariel, Buzz Lightyear, Alice and Mickey and Minnie dressed as king and queen. Attention runners, course narrows ahead. 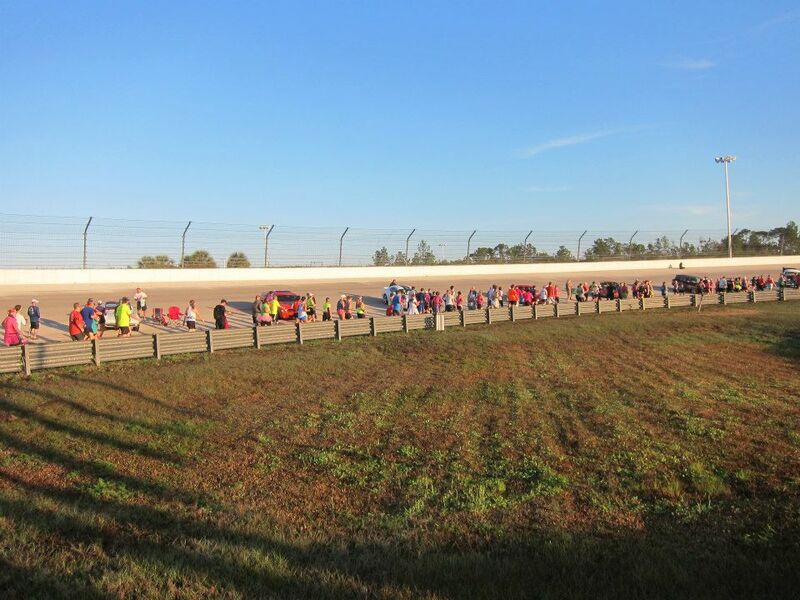 It narrows right to the Walt Disney World Speedway. The speedway was a new edition this year and it was great. I loved it. I can’t imagine doing the long loop between the Magic Kingdom (mile 6) and Animal Kingdom (mile 10) without some sort of distraction. You’re in Disney. Why not run somewhere fun? There have always been character stops along the way to Animal Kingdom, from what I understand, but I think the race looked pretty boring before they added this section. Lightening McQueen was hanging out with some classic cars. This was probably my second or third favorite part of the race. You gotta stop for Mickey. I love Animal Kingdom and I was a little disappointed that this loop (mile 10-13) was so short. Animal Kingdom is Disney’s largest park. It deserves more mileage. It was also this part of the trek that I was getting hot and thought I should cut back my effort. As I cut back, a runner jogged up next to me and asked my pace. I told her I was doing 14-15 minute miles, and I was just going to take it easy. She asked if we could run together since I seemed to be keeping a consistent pace (I had two Garmins – I’m a geek). That was fine. 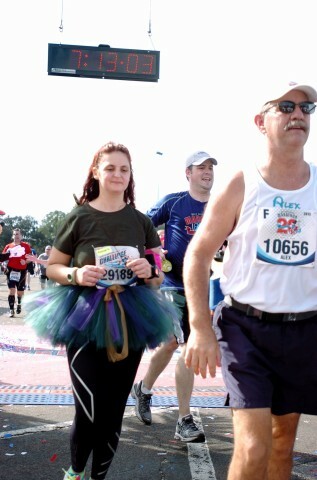 We talked a bit about the last Disney race, since she ran in it. Then I saw Rafaki, and he didn’t have a line. I stopped for a photo and figured I would catch up, because I wasn’t tired and I can run a lot quicker than I was running. I never saw her again, because I stopped quite a bit more after that. Oh well. Sorry, if you read this. I hope you finished in the time you wanted to finish in! I think my phone said it was 85 degrees when I stopped to take a photo with Rafaki. I decided that it was too hot, and if I’m going to have a photo with Rafaki, I need to get Minnie and Daisy (dressed in safari gear), and Mickey and Pluto, and a few more too. From then on, my time flew out the window. That’s what Disney is about though. If I hadn’t stopped for the photos, I don’t think I would have had as good a time. I decided after Mickey (his line was about 20 minutes long) that as long as I finished in under 7 hours so I qualified for my Goofy medal, I would be ok. Animal Kingdom also had some petting zoo animals on the route and it took us “behind” some parts of Animal Kingdom (before then I think I we went by some sort of waste plant. It smelled even to me, and I’m used to working with animals). Expedition Everest was open and runners got a “fast pass” to ride it. It was a real blast. This is how I felt at ESPN, though it was taken earlier in the race. Contrast the “blast” of Animal Kingdom to the cruel and unusual punishment of ESPN World of Sports. What was Disney thinking adding this? This was new this year too, and it was awful. Though, I’ve read that other runners enjoyed it (could be the old route was even worse), this was the only part of the course that I felt overheated and sick. It might have actually been fun if it wasn’t so hot. There was no cloud cover and tons of concrete on the way to World of Sports, I’m sure that didn’t help, but there was also very little in the way of shade at World of Sports. We got to run around the baseball field, but I didn’t even pay attention to the announcer or the crowd at that point. I always thought I was too slow to “hit the wall,” but around mile 18, I did. I could barely see straight. I was thinking of trying to find a medical tent. A water and banana stop came just in time. After some Powerade and a banana, I felt ready to go again. Thank goodness, because the special 20 mile spectacular Disney promised was right around the corner. I couldn’t bail out before that! I was so excited to see what it would be. A band? A party? A parade or fireworks? Something only Disney could imagine, right? OMG I CANNOT WAIT! It’s right around the corner . . .
Can my wish be for something more spectacular than this? Uh wait, this is the spectacular, or should we say not so spectacular? The big deal at mile 20 ended up being a bunch of Disney character puppets on stilts. Lumiere, Genie, Mike and Sebastian were there and Mickey, Minnie and Pluto were dancing next to a 20th Anniversary banner. Had it not been built up so much, I think it would have been a cool stop, but I was disappointed. On the other hand, I think my total disappointment in this spectacular gave me a second wind, so maybe Disney knew what they were doing. Or maybe the banana was kicking in. I’m going for the banana at this point. Up the road from this was the more spectacular army man from Toy Story. He was yelling out insults and inspiration, “This isn’t a walk, soldier, it’s a run. Pick up the pace.” “You can do it, soldier. It’s right around the corner.” He should have told the Disney folks their spectacular’s pace needed to be picked up. He was awesome. I think I’m still looking for the great 20 mile spectacular…is it over here? Anyone seen it? This loop is too short too. It’s about mile 20-23. Just enough to snap some photos of the iconic Sorcerer’s hat and run through part of the backlot tour. This area was at least shady and a little cooler, but people were starting to give up by this point. Everyone was walking. 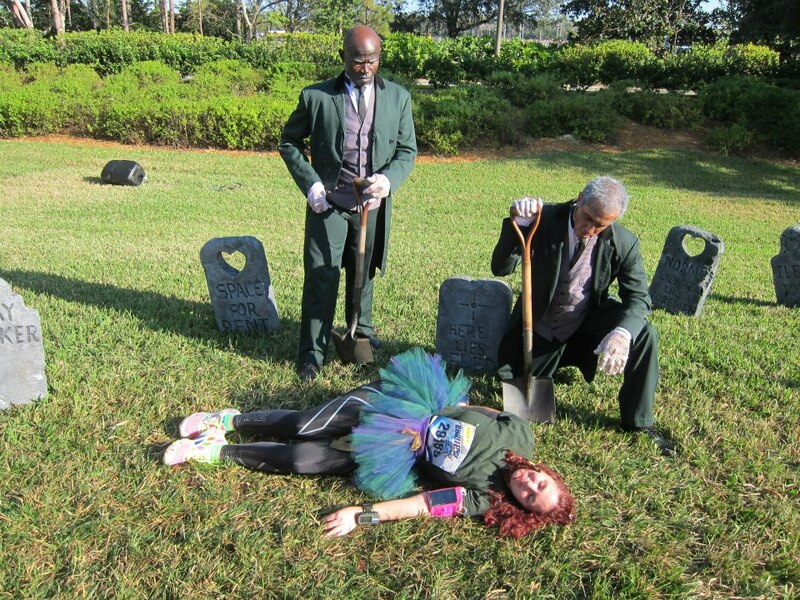 When we walked through the backlot, I actually got up on the sidewalk and ran past everyone, because there was no getting around them otherwise and I was afraid I’d finish in more than 7 hours. This is the point in the race where I only had about 26 minutes to spare if I kept consistent 16 minute miles from that point on. A 16 minute mile is not hard to keep, but the people in front of me were walking 20-25 minute miles. Everyone was beat. I had read they check times, and will deny your Goofy medal if you’re over 7 hours. I wasn’t going to make it to mile 20 only to get denied. So, I started politely cutting through, trying to get passed people and obsessively checking my Garmin questioning “How many minutes a mile do I have to do?” I was so frustrated. After that we headed to the Boardwalk where there was no getting around people. ARG! I was so frustrated. I had saved a push for the end, just in case I needed it to get in under 7 hours and I wasn’t going to be able to push through the crowd. I look Goofy here, but Spaceship Earth is AWESOME. Plus, I think I’m dying from heat stroke in that costume. 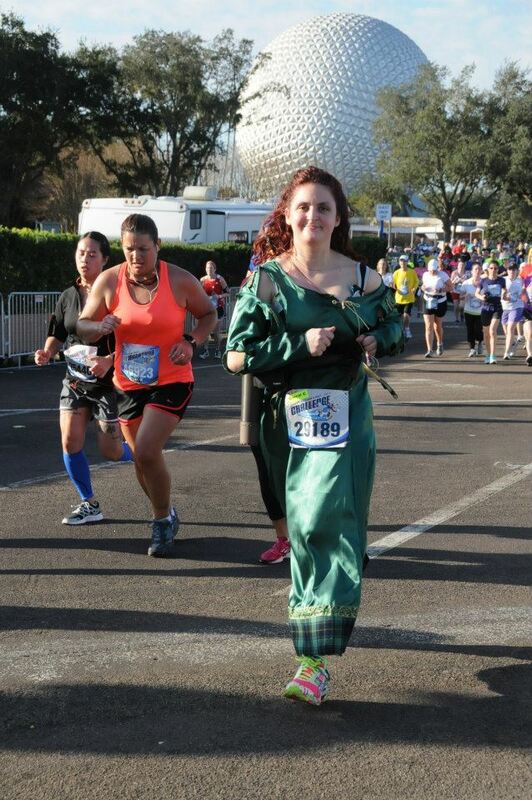 Epcot was my favorite part of the half marathon. Seeing Spaceship Earth almost brought me to tears. I’ve seen it before, but something about that morning made it special. It reminded me of watching Walt on television talk about it, and talk about Epcot being the city of the future. I get that every time I get near the great geodesic dome that is Spaceship Earth, but this was different. I can’t explain it. I never get emotional at races. The morning of the half, I did. I was running through Epcot. Awesome. I can’t say I felt the same way during the whole. I was freaking out. I knew there were less than 2 miles left and it looked like I wasn’t going to get my Goofy medal. I told myself I didn’t really care. Running this was about the experience and didn’t I have fun? Who cares about a medal? But I did care. No amount of talking myself out of it would keep me from caring. I wanted my medal! I pushed and pushed through the crowds of people. I understood. It was hot. Many of these people had been training in freezing weather and snow. I wasn’t upset with them. I was frustrated at myself for stopping so much. I was upset that I didn’t run more and walk less. I had 15 minutes to do the last bit and Jimney Crickets, I was going to do it. I was going through a scenario in my head where they denied me the medal, and I argued that I deserved it, because walkers wouldn’t move to the right, the course was too crowded, etc. I ended up coming in at something like 6:54:07. When I saw the time on the clock, I was so relieved (the time on the clock was actually a little over 7 because of the corrals, but I knew what I started). I did it! I ran up to the lady and got my Mickey medal and asked where to go for Goofy. The most grateful I’ve ever been for such a craptastic finish time! Then they didn’t even check times. They saw my Goofy bib and motioned me over, “Here’s your goofy medal.” I don’t really care that they didn’t check times, but had I known that I wouldn’t have tried so hard. I guess I’m happy I did because now I really earned the Goofy. Had I came in at 7:15, I probably would have thought I didn’t deserve it. Overall, it was a really fun race. I would do it again, but I think I need to aim a little higher next time. I set my Garmin on a 15 minute mile pace, thinking that if I at least kept up with that, with all the stopping and stuff, I would be fine. I should have set it on 13 or 14. That would have given me more running time and a little more buffer at the end. On the other hand, I felt great and walked all the parks in the three days after the race. 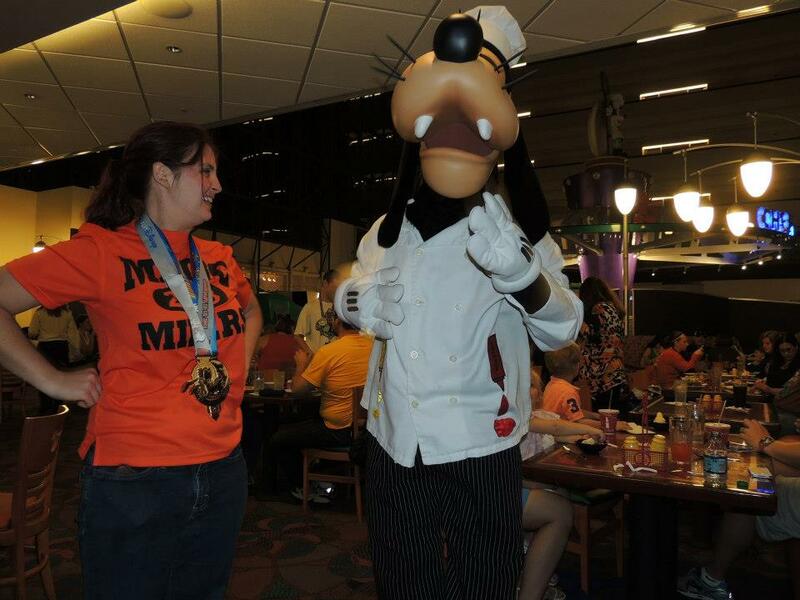 This is at Chef Mickey’s, but Goofy got a kick out of my medal there too. I told him I’d been looking for him all day! 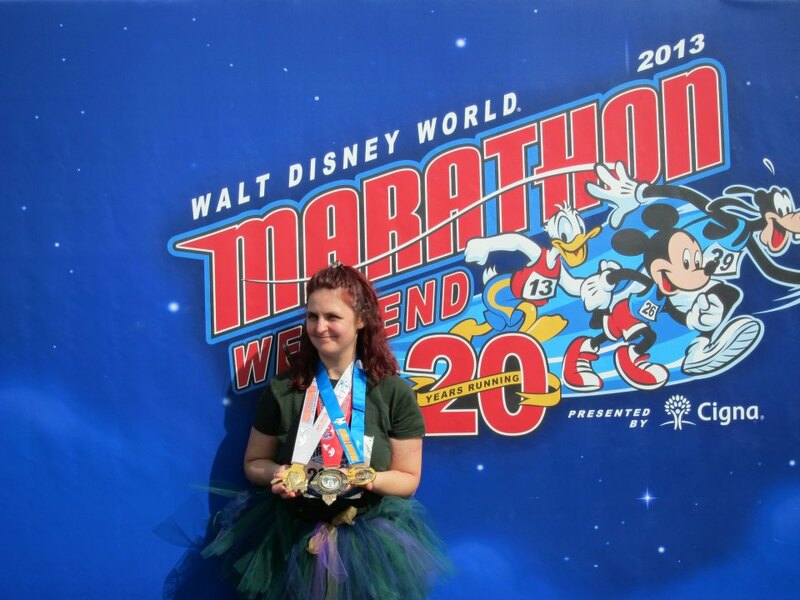 Wearing your medal around Disney is a lot of fun. Even the characters notice. Goofy flagged me over in Epcot when I waved at him and he noticed my medal. He pointed at it and gave me a big Goofy hug. Donald refused to be photographed with the Mickey Medal and only wanted the Donald one. All the park staff make you feel like a hero too, telling you congratulations. 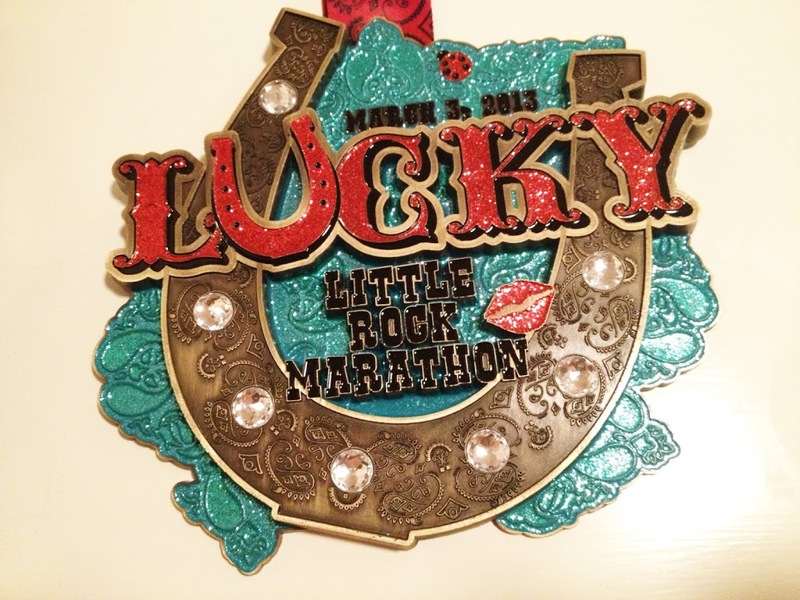 I’m not normally one to wear a race medal after leaving the race, but this was too fun not to wear. Heck, I want to wear it everyday. I’ll post some stats from my various body trackers within the coming days to compare them. I think that will be fun. My Garmin died right before the finish, so it will incomplete, but I also wore a fitbit and a Bodymedia band.